April 17, 2016 by Dreamz Unlimited! Directed by Akashdeep Sabir, the film features Vir Das, Boman Irani, Lisa Haydon and Neha Dhupia in lead roles. Music is given by Jassi Katyal, Amjad-Nadeem and Jaidev Kumar. CLICK HERE to buy the Soundtrack of Santa Banta Pvt. Ltd. from iTUNES!! 1. Machli Jal Ki Rani Hai – Singer: Sonu Nigam, Vikas Bhalla – Except Sonu Nigam, there’s nothing in this song to boast about. The composition is undoubtedly catchy but the lyrics is simply disgusting, making no sense. It is Sonu who infuses interest in the track with his amazing creativity in between. Sonu Nigam entertains. 2. Tooti Bolti – Singers: Mika Singh, Sonu Nigam, Dolly Sandhu – Another Punjabi party number, a kind that has been heard numerous times in numerous styles. Sonu and Mika have invested huge efforts in the song and their efforts have not gone in vain. The song is very bearable because of them. 3. Ishq Karle Anytime – Singers: Mika Singh, Sonu Nigam, Dolly Sandhu- Again both the singers have made the song bearable, which is otherwise an insane track with absurd lyrics and extremely weak tune. It shows the very less work done in the track by Jassi Katyal. 4. Hit Kardi – Singers: Sonu Nigam, Daljit Dossain – You might want to bang your head if you hear the lyrics. And this time Sonu Nigam fails to make the song bearable. After the mukhda, it becomes a pain in the ears. The beats are such that if you mute the words, it’s apt for dance. 5. Lo Aa Gaye Santa Banta – Singer: Sonu Nigam; Guest Composer: Amjad-Nadeem; Guest Lyricist: Shabbir Ahmed – This title song simply gets unbearable, having Sonu Nigam in a weird sounding voice which does not at all appeal in any way. Shabbir Ahmed can hardly be expected to deliver something good though the level of absurdness is less this time. You just wish it ends soon! Jassi Katyal and Kumaar team up to deliver a collection of absurd songs. May 1, 2015 by Dreamz Unlimited! Anand Rai is back with the sequel to his lovable Tanu Weds Manu. After the success of Raanjhana, one has huge expectations from him. Although AR Rahman was the composer of Raanjhana but since Krsna had composed for the first part of Tanu Weds Manu, he was bound to be on board. Along with Krsna, there’s a guest composer duo Tanishk and Vayu. Also, Krsna has started writing “solo” after his name. The reason is unknown. CLICK HERE to buy Full Soundtrack of Tanu Weds Manu Returns from iTUNES!! 1. Banno – Singers: Brijesh Shandlya, Swati Sharma; Guest Composer: Tanishk & Vayu; Guest Lyricist: Vayu – Swagger is denoted to a coat or jacket with a loose flare from shoulders (for those who don’t know). Guests are the most important part in our culture so the soundtrack starts with a solo composition from the debutante duo, the guest composers Tanishk and Vayu. They manage to grab the listeners’ attention quite well with an extremely cute and catchy tune that goes well with the two new singers Brijesh and Swati. The hook line is a popular folk-inspired tune, commonly known as “banno tera mukhda, chaand ka tukda”. The arrangements are fresh even with the most typical instruments Nagada and Tumbi played in the most typical way. An excellent start to the musical journey of Bollywood for Tanishk & Vayu. 2. Move On – Singer: Sunidhi Chauhan – It’s a break-up song that do not ponder about things like judaai or tanhaayi. Instead, it tells you to happily move on with your life. Raj Shekhar’s aptly written lyrics perfect for the situation is an attention seeking element in the song. Rhythm is vibrant with antara being the best portion in the song and who better than Sunidhi could have justified it! The line “move on” could have been catchier as it gets monotonous after some time though the lovely antara which slightly finds itself in the zone of Mannat (Daawat-e-Ishq), covers up the minor flaws in the song. A good conceptual and pragmatic track filled with positivity. 3. Mat Ja Re – Singer: Ankit Tiwari – Yes, a bit 90’s style composition but the song has been programmed really well, giving well-deserved space for the Daphli to play the Keherwa rhythm which always helps the song reach its efficiency along with two nice Harmonium pieces in both the interludes. Ankit Tiwari, for a change, sounds totally different from his usual sung songs and that change is for good. One might wonder the reason behind this to be the voice of him used is his original and not autotuned. That’s the only reason visible. Anyway, the composition in spite of having a 90’s touch, is catchy and lovable. 4. Ghani Bawri – Singer: Jyoti Nooran – Amazingly cute composition by Krsna that is sung by Jyoti with utter cuteness and Kangana is expected to bring more cuteness to this on the screen. Again. the programming is excellently done which makes typical Punjabi arrangements sound very effective. Lyrics are also really cutely written by Raj Shekhar. It is surely going to be one of the most enjoyable tracks of the year, being played in every house, particularly in wedding ceremonies. Deserves repeat listening! 5. Old School Girl – Singer: Anmoll Malik – This is a surprise from Krsna and Raj Shekhar as an English Jazz styled track wasn’t expected at all. Luckily the surprise is in favor of the listeners as the track is really good and the lyrics are perfect according to the situation. Trumpet wonderfully accompanies Anmoll who has done a fabulous job, rendering it in just the way it needed. A Jazzy track in a Punjabi-oriented soundtrack is a wonderful treat. 6. Ho Gaya Hai Pyar – Singer: Dev Negi – A nice romantic track with lyrics again perfectly matching up to the situation. Dev Negi gives quite a decent performance being accompanied by mild Guitar and by Tabla in the antara and later by the beautiful combination of Violin and Shehnaayi played in the end. The song could have been more interesting, lacking some good arrangements. Pleasurable! The floating career of Krsna after his debut in Tanu Weds Manu finally seems to get stable with its sequel that provides a soundtrack which is full of Love and Happiness. November 19, 2014 by Dreamz Unlimited! The most successful filmmaker of our generation Rajkumar Hirani has again arrived with his latest PK, a film about an alien played by Aamir Khan as known by the sources. I wonder for what reason Raju Hirani has gone towards multi-composer trend which is not liked among music lovers. Apart from his regular Shantanu Moitra there’s Ajay-Atul and Ankit Tiwari with one song each. 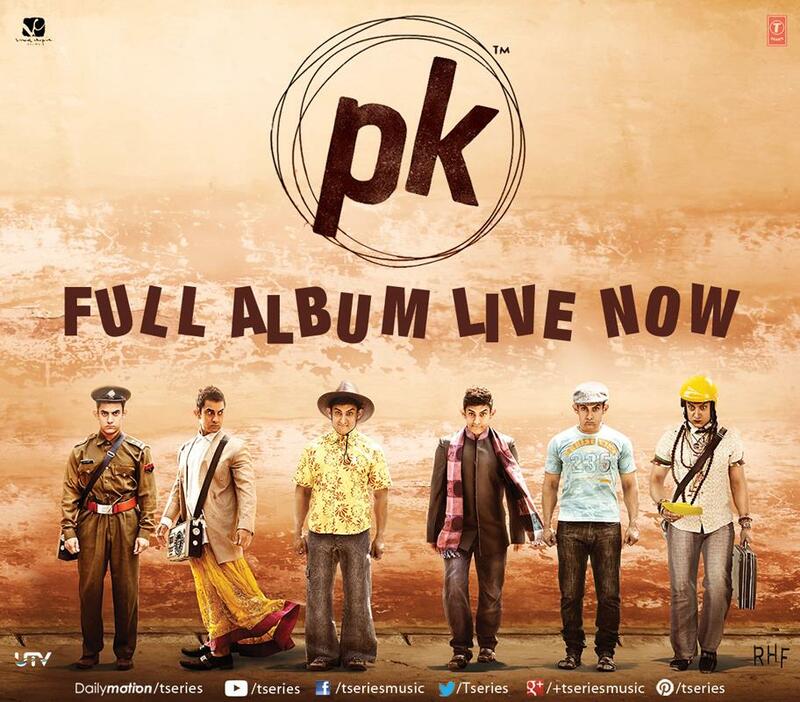 CLICK HERE to buy Full Soundtrack of PK from iTUNES!! Shantanu takes hold of the soundtrack by this catchy child-like melody in which Shreya has fully justified the mood of the song by doing all the nuances which is needed. Swanand has an amazing contribution for the song to sound good. His phonetic nursery rhyme-ish words really helped in beautifying Shananu’s situation based tune. The way the Violin has been played, is simply outstanding. Even if you are not eager to hear, just hear it for the applauding Violin pieces. A dreamy duet which lays on the lines of some of Moitra’s own compositions but thanks to him for bringing Shaan back and giving him a song which surely leaves you with a smile. The part from which Shaan begins, is minutely related with Dil Kyun Ye Mera (Kites) only if noticed minutely. The orchestra is typical Shanantu’s style having western-influenced backing vocals in the background as a part of arrangements. Inspite of heard-before feel, the song is likable. If you notice the tune which Sonu croons beautifully, you come up with the groove of Pal Pal (Lage Raho Munnabhai). That’s exactly what the rhythm of Pal Pal is. Amitabh Verma’s lyrics would really make Indian parents happy as love is really a waste of time according to them. Along with taking his own song’s reference, Moitra infuses retro touch to it by a mild Accordion and the chorus. This would surely give you deja vu of Pal Pal and Zoobi Doobi. The first half of the first line of the mukhda resembles a lot with a song from Mamta In Bahaaro mein akele na phiro. The rest is pure Shantanu stuff though the antara is something that is not his style and surprisingly antara is the highlight of the song. The way Sonu takes it to a higher note, you just don’t want it to end. Swanand’s lyrics is really thoughtful and morally good. It’s a Sonu Nigam show all the way! While listening to it, Barfi!’s background score came into my mind. Yes, the innocence factor in the film must be like Barfi! only. Shantanu has done much use of Violin quite efficiently which is creating the comic as well as the emotional feel together in one single instrumental piece. The basic theme tune is absolutely catchy and has a strong positive element to it. Do give it a try! People calling it Galliyan part two, well not exactly but sort of lands into that same zone of romantic songs which sounds very odd in this Hirani – Moitra atmosphere. This one seems to be a producer’s demand as nobody is able to guess how it would be able to fit in such a film. The use of Oud is damn impressive. The song has hardly any flaw, still this one is an unwanted guest, as you don’t expect your mamis or chachis to come on your bachelor’s party but loves to meet them otherwise. Not for #PK. An album that lacks freshness, still is a break from the regular “Bollywood” stuff. Ajay-Atul turn out to be a grace, Shantanu Moitra maintains the innocence and Ankit Tiwari is an unexpected guest here. October 25, 2014 by Dreamz Unlimited! Shankar-Ehsaan-Loy if team up with Gulzar, that means it’s a Shaad Ali Sehgal film. From Bunty Aur Bubbly to Jhoom Barabar Jhoom to now Kill Dil, this team is again promising to deliver something really awesome. CLICK HERE to buy Full Soundtrack of Kill Dil from iTUNES!! Starting with Gulzar’s verse narrated by the man himself, this song tributes the Classic Western music perfecting in Brass section, a lovely rendition by Sonu Nigam with Shankar, doing the yodelling brilliantly well, performing almost the whole song in the false voice. Whistle and the Guitar in cowboy-ish style is worth tempting. It addicts you and makes you hear Sonu doing the creative stuff after a long time. This is not exactly a birthday song that you can sing out on a birthday party. It’s a situation based track for which Gulzar has written nice fun lyrics. Composers have also tried doing fun stuffs like the amusing way of playing Sitar in the starting. Sukhwinder has just nailed it in his very style that impresses in a minute. A song that grows. It gives you an instant 80’s feel, particularly the Sholay feel in the Strings section. A lovely and strong hook by Shankar Mahadevan is a treat here. Already energetic Sunidhi and Siddharth, get highly energized on the wonderful foot-tapping beats laid with dynamic Dhol in the typical trio style. What Hulla Re was for 2 States, Bol Beliya is for Kill Dil just that the latter is less appealing for masses. Nice rhythmic track! Adnan Sami after a long time renders lovably with utter cuteness in his voice, making all the one-sided lovers dance like mad. It’s a song when the lover adores his girl and sings and dances within that module. Gulzar’s lovingly weird lyrics make it more interesting along with the help of Shankar-Ehsaan-Loy’s swinging tune. Such a sweeta track with such a short duration is a thing to be upset. Starts with lavish Trumpets and suddenly takes a turn into a deep Punjabi mode, playing Tumbi all the way. Harmonium paves the way for Udit Narayan, who has been singing quite often this year but this song in particular is suiting him perfectly. Trio has used the backing vocals very efficiently in the hook line that surely provides a smile. Rasika is decent in her portion. The rap by Javed Jafferi is worth listening. It’s a song with weird twists and turns. Gulzar begins with his nice poetry and a haunting Guitar piece joins him which is the highlight of this track. The song has a semi classical touch and the trio has intelligently infused some ingredients of Rock. The line Zindagi uljha hua sauda hai will stay with you for very long. Apt use of Sarangi and Flute and the controlled use of Electric Guitar. Nihira performs quite well but Shankar Mahadevan as always just nails it. Not a regular sad song. Unfortunately, this one last track neither leaves a good impact of Gulzar’s poem nor appeals any further to listen the composition. All the three singers fail to create any impact. It sounds very 80’s and doesn’t have the much needed freshness in the arrangements as well as in the composition. Ending note is a disappointing note. Shankar-Ehsaan-Loy when team up with Gulzar, the album is bound to be a killer one! Barring Nakhriley, not a single track should be skipped. October 8, 2014 by Dreamz Unlimited! Although Richa has exhausted herself doing similar kind of roles, still we enjoy watching her being like that only. This time, along with Nikhil Dwivedi, she has come up with a very different kind of love story. A story about two gangsters falling in love with each other. Richa is a Delhite and Nikhil belongs from U.P. The trailer is quite likable. The music has been given by Krsna whose acclaimed work is Tanu Weds Manu. Besides him, the guest composers are Arko Pravo Mukherjee and Ikka. CLICK HERE to buy Full Soundtrack of Tamanchey from iTUNES!! This kickass 70’s song kicks off with the original version by Kishore Kumar and Asha Bhosle. Things get more accurate when Bappi Lahiri’s vocals hit the track on the Trumpet and 70’s style guitar-led arrangements. Krsna has arranged it superbly, barring all the flaws in the recording of the old version. Lyrics by Puneet is apt and goes well with the theme. The rapper Luv O Trigger’s job is quite decent. This recreated track is clearer, more energetic and more vibrant. Irrespective of all those qualities, all respect for R.D. Burman’s fantastic tune. What else can you expect from such kind of a track! There are beats, a nonsensical rap, a monotonous composition and high amount of similarity from the previous song of this genre. It seems that Honey Singh and Baadshah were not enough for the listeners, that Ikka has come all the way to irritate us. As usual, no instrumentation, just the game of techno sounds which anybody can learn sitting in front of computer. If there’s “club”, then the words like “sharaab“, “naach“, “baby” etc. are highly essential to include otherwise, how can you call it a Club song! You are bored of these songs. Accept it! A free-style composition with usual instruments like Harmonica and the use of whistle has made the song quite easy on ears. Mohit’s version is definitely more intriguing. Mohit’s vocals are anytime the best for these kind of acoustic songs as they hold the composition quite well irrespective of the instruments used in it. The composer’s singing is less tempting though the arrangements remain the same. The Reprise is the worst among as the song goes damn slow making it very dull and sleepy. A nice attempt by Krsna. Arko aur Krsna ke Tamanchey se nikli suron ki meethi Goli. August 5, 2014 by Dreamz Unlimited! I personally haven’t heard the name John T. Hunt before. Yes, he is the composer of this album consisting of six songs and eight tracks. Lyrics of all the songs have been penned by Vimal Kashyap. 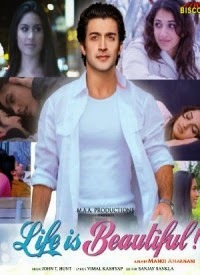 CLICK HERE to buy Full Soundtrack of Life Is Beautiful from iTUNES!! Nikhil clearly rules here with his synthetic vocals. The basic tune is quite decent but the arrangement of the instruments seems to be a problem here. A Sarod-like sound has been used in the first interlude which doesn’t at all suit the mood of the song and spoils half of the pleasure. Lyrics have nothing to do justice with. Tune is the only saving grace. It’s a typical Rahat Fateh Ali Khan song having all those elements like his harkatein, typical words like sajna and the most important instrument Tabla. You won’t come across anything new in this track. Instead, you may come across some of the old tunes which quite similarly have been used in this song. Although the song is nice, the composer and lyricist are not much responsible for that. So, the credit goes to all the old Rahat Fateh Ali Khan songs whom they are inspired from. Old sound. Less creativity. Listening to the most favorite jodi of 90’s and early 2000’s, Udit Narayan and Alka Yagnik, doesn’t seem to impress much in today’s time. I wonder why the composer John has gone a decade old to produce this soundtrack. The composition is decent but boring at times. The Piano at the starting is truly beautiful. The song loses its charm completely in the bridge connecting antara to mukhda with a Piano that awfully sounds irritating. The arrangement is traditional dafli style which should have sounded soothing but the staleness in the composition spoils everything. The same Sajna Ve by Rahat Fateh Ali Khan becomes Mann Bawra in the voice of Naushad Ali. It starts with a Rajasthani essence that Naushad’s vocals manage perfectly. Naushad Ali’s singing really impresses. The best thing is that inspite of having heard the Rahat’s version, you won’t miss him while hearing this. All the arrangements are exactly the same. In both the tracks, the sajna ve part could have been much better. The same as Sajna Ve just in the voice of Naushad Ali. A typical Punjabi pop oriented track that has a catchy attractive hook line, Nagada based arrangement and a singing style with so much of attitude and arrogance and overconfidence. Yes, it’s all about these few things. Richa Tirupati has hardly any role to be able to understand how good she is as a singer. This is just another track that you must have heard before. Life Is Beautiful – The debut composer John T. Hunt visits the previous decade and brought out some tunes that actually resembles that era. Unfortunately, due to poor arrangements and instrumentation, this visit didn’t go as he would have planned it to be. April 3, 2014 by Dreamz Unlimited! When you are obsessed with music labels for copyright related issues and you plan to do something that makes music labels start following you, you must be Sonu Nigam. When the companies stopped offering him to sing songs, he started creating them. He teamed up with Bickram Ghosh last year, a renowned percussionist, in Soopar se Oopar and composed his first film album. Though the album didn’t do well, he didn’t mind and moved forward to compose his next album. 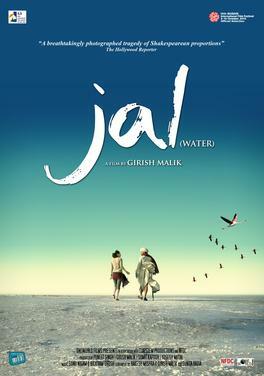 Jal is set in the Rann of Kutch, India about an overconfident water diviner named Bakka, who tries to solve the drought problems in his village, but faces unforeseen circumstances when he tries to help a female ornithologist save flamingos. It’s an enormous example of a real fusion. Probably, the best choice composers made by giving this song to Suzanne. It’s a peaceful soothing melody which might be helpful for meditating. A perfect westernized basic tune with English lyrics intelligently blended with the pure Classical music. Again, the perfect choice for the classical part. Sonu Nigam finally debuts in lyrics too with Bickram Ghosh and what a phenomenal work they have done! Harmonica has a minute but mesmerizing role in the antara and the same goes for Sarod played in the end. The song would have a better vibe if it had a shorter duration. It MAY be felt boring to some after a while but perfect for those who like peace and fusion and a peaceful fusion. Sonu Nigam’s Takeedein (Warning) effect has again come alive in this weird techno track which has been solely written by Sonu Nigam. For the same vocal texture, he had won the Musical Sameekshaa Awards last year. The composers have kept the techno element more than the requirement and that somewhat dominates the basic melody. The tune of the mukhda is beautiful, haunting and catchy. The rhythm is engaging and constant throughout the song. A lot of experimentation has been done with the interlude which makes it boring and stingy to this otherwise well composed melody. If you loved Takeedein (Warning), give it a listen! If you haven’t even heard Takeedein, must listen! A track with a very short duration, emerges out well because of the brilliant singing by Ambarish Das who sang for the second time for Sonu and Bickram after their first album Soopar Se Oopar. The melody is quite effective with a cool Piano base but the best part is its prelude which is played with Sarod. Another element to listen for is the ending alaap by the singer that makes the song worth the attempt. The Sorrow Within has heavy violin orchestration with a mourning sound making the title quite apt. The Sweet Dream Of Water starts slowly making the listener thinking of it as a meditative track but soon catches a wonderful rhythm with a Djembe resembling sound and enchanting Matka beats. Oh yes, it has vocals too, and that is more than enough for an instrumental track. The Tragedy Of Rann is a very very short track with a haunting and depressing sound which is quite apt. The Water Ritual 1 and The Water Ritual 2 have the magic of Bickram’s percussion. The former being the lighter and the latter is a level higher having a greater frequency of rhythm and also some heavier sounds. It seems that Bickram Ghosh decided to show all his creativity in the two longest instrumental tracks, Anger and Chase filled with different percussive elements that is a treat for all the percussionists. Ankhiyan – Anthem first seems to be an additional instrumental version of You Fill My Life as it has Ustad’s part of the parent track. But it has many such more elements that is really beautiful like the Sitar played in the middle and ending responsibly done with Sarangi. For a change, there’s brass section applied in Bakka and Kesar – The Tryst With Water and a voice too with an intense alaap. Dried Up Tears has beautiful Sarod aptly supported by Piano in the background, which after a while is replaced by Violin and at the end comes Sitar while Violin being continued. Sarangi along with Flute creates a soothing impact with the help of Violin in Mesmerized By Rann while Nature and the Machine and The Barren Land is again an applauding percussion show and yes, with Sarangi and Violin respectively in background. The Cry of the Soul is an apt melancholy and The Flow of Water has beautiful sound of water flowing played most probably by Santoor which is continued in The Hope of Water also. Lastly, Bakka Pani De and The Mirage and the Tornado have repetitive haunting background with good rhythm, the former being more lovable. Jal is a light soundtrack if you consider just the songs but a very lengthy one when instrumentals are included. All the four songs are beautifully composed. They all have fusion texture which have interesting sounds, instruments intelligently played with the wonderful support of percussion. Jal De is undoubtedly the winner as I failed to mark any flaw in the track. Too much instrumentals have been included which doesn’t create a good impact on a listener only if he is highly not involved into music. The album is also a nice gift for percussion players and lovers and yes, for Sonu Nigam fans. After a disappointing start of their collaboration, Sonu Nigam and Bickram Ghosh has shown immense art and creativity in their second musical outing. In #Jal their music reflects their genius.Tabla aur Guitar ki jugalbandi hum pehle bhi sun chuke hai in #RockQawali.. Take a bow! We are blessed to have musicians like the two of them. Hat’s off to what you’ve done in #Jal specially Zaalima n Jal De. OMG! I got goosebumps listening to Zaalima from #Jal. The music and singing was out of this world. Solid! Loved Sonu Nigam’s voice in Zaalima. Sonu Nigam and Bickram Ghosh’s music of Jal has every property of JAL, it quenches your thirst of music & drowns you are completely into its beats & tempo.